Ever read so fast you skipped sections? Not because you weren't interested. The story was so good you wanted to get to the next scene as fast as possible. 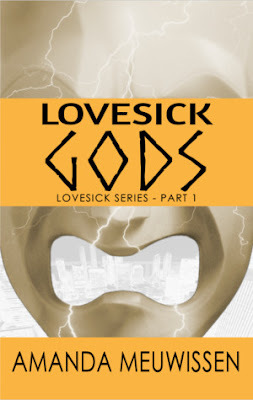 That's how I felt about Lovesick Gods by Amanda Meuwissen. I devoured this book. The characters were so fun. The story is super nerdy. Superhero romance, heavy on the sci-fi. The main characters have powers! You know how much I love characters with abilities. One of them even had ice power. My favorite. If I had an ability, it would probably be ice powers. I like how the author dug into the magic system. Some books have magic but they don't really explain it. Meuwissen gave us a good idea of how the magic worked and how it affected the characters' lives. On top of that, we had superheroes but they weren't pure good. They were complicated. The story's very angsty. Not saying it's a good or bad thing. I did have a moment where I got frustrated with one of the main characters. His angst stopped him from seeing the truth. But, I had to keep telling myself his reactions, his emotional state, was probably realistic. I'm not an expert on mental illness but I'm fairly certain the author portrayed it well. This story was way deeper than I expected. It delved into some complicated issues. The characters lived in this gray area. You know how much I love that gray area. Now, let's talk about the romance. The main characters, Mal and Danny, have known each other for a while. Danny, the superhero, often encountered, Mal while he robbing some establishment. They saw their battles as a fun exercise. Danny wasn't so rigid that he couldn't see Mal was relatively harmless. Mal's a villain but he's a fun one. Not like Loki. More like a male version of Catwomen. Their chemistry was on point. Loved the banter. They were just so cute together. Couldn't get enough of their interaction. I like how they were kind of healing each other. The main reason I like this genre, M/M fantasy romance, is that most of the authors know how to do diversity. Characters are often different races and skin tones without them being token or stereotypical. M/M fantasy are some of the most diverse stories I've read. Lovesick Gods was no exception. But, I did not like how it ended. That's what keeps me from giving this story five stars. It was the kind of cliffhanger that made you want to throw the book across the room. I'd read Part 2 because I've become invested in these characters. The cover was another issue. Since I'm a blog tour host, I discovered this book through an email. There wasn't a cover, just a description. The summary sold me. If I'd come across the book cover first, like I usually do, I would've scrolled right by it without clicking. I'm not a huge fan of the cover. Overall, it 's a fun, sweet and unexpectedly deep fantasy romance story. Heroes aren’t meant to act like their villains—or fall in love with them.